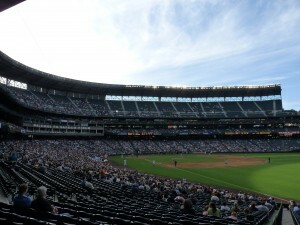 The reported attendance of Thursday’s White Sox-Mariners game in Seattle was just over 16,000 with game time temperatures in the low 70s complemented by a light breeze and plenty of sunshine. To those on hand, it was a perfect day for a ballgame, even if both teams had abandoned all hope months ago and neither had anything more to play or cheer for beyond spite and personal gain. They hated themselves for being there, yet loved being there because with all lost they were free to be themselves, players and fans united in their indifference and respective afternoons off. They were sad, yet in their own small, heroic ways they were happy at the same time, able to be all this at once because these people, like everyone in Seattle, either cared too much or never bothered at all. I know. I was one of them. The thing you need to know about Safeco Field is that it really is as good as everyone says it is, even though everything about Safeco Field also screams contempt for everyone in and around it. For $8, you can get a view from the center field bleachers that for sheer scope rivals anything Chicago has to offer; for $8 you can also get a cheeseburger. Safeco also has a rolling roof, a marvel of modern engineering that can cover and retract on a moment’s notice without interrupting gameplay. When open, the roof also creates an echo chamber over the train yard next door to the ballpark. You know those horns and whistles you hear during broadcasts? They’re even louder when you’re sitting 100 feet away. But the weird idiosyncrasies about Safeco aren’t really a product of the park’s design and management, but rather the culture of Seattle and, in many ways, of the team itself; Seattle is a fairly smart and open-armed city, but everything is done in as ironic fashion as possible. They have the only working monorail in the United States, but it only goes between two points (Westlake Mall and the Seattle Center) no actual Seattleite ever ventures. They built a fantastic light rail system to connect the city to Sea-Tac International Airport that doesn’t actually go to the airport. Their locally revered brewery, The Pike, is housed inside the tourist mecca Pike Place Market (better known as “the place where they throw the fish”). Bars play Nirvana, Pearl Jam and Death Cab for Cutie endlessly even though everyone in Seattle moved on from those bands years before they ever became famous. Why? Because people expect them to. By playing on the contempt they have for the music and those who expect Seattleites to listen to it, the people of Seattle win. To think of Mariners baseball, of course, is to think of Griffey and Ichiro Suzuki and Alex Rodriguez and Randy Johnson and all those great players who came together and . . . well, won some games when it didn’t count, but also instilled a tradition of only winning when they weren’t supposed to while losing only when they seemingly couldn’t. The 1995 team went on an improbable 20-9 run to close out the season and clawed their way to a game six defeat in the ALCS; the 2001 club won 116 in the regular season yet lost three close ones in the ALCS and a 12-3 game five that canceled out the 14-3 clown show they won in game three. So when the Sox took the field against a team built on this kind of lifestyle, you can imagine what would happen. John Danks would throw one of the best Sox outings of the season despite having terrible career numbers against the Mariners. Bobby Jenks, who had entered the game with only two runs surrendered to the M’s in 18 innings, would promptly cough up two runs via home runs in 10 pitches to Jose Lopez, who is an okay hitter, and Bill Hall, who is not. In the 14th, Ichiro, a man with no walk-offs of any sort to his credit, laced a single into the outfield off of Scott Linebrink, no stranger to late-inning defeat. But he had to; in Seattle, the right man for the job and the wrong man for the job are the exact same person. As Ichiro jaunted into the outfield to celebrate with his teammates, I held my head in my hands at the horror of it all. Not at the loss, and not at just how it all went down, but that in the end, I was still no different than the men in white and black, as they and I both had traveled two thousand miles to be told that which we already knew. You get the idea. That’s pretty much sums it up. I’ve been here long enough to see some great M’s teams (2000, 2001) and some bad ones (all the rest) and both times people were about the same, only difference between whether they said their “Meh”‘s at Safeco (when the team was good) or at the bar (when they were bad). 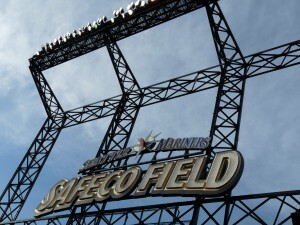 But I really think Safeco is the best park in America, and I’ve been to most of them. I can’t believe you (or ANYONE!) paid good money to watch that piece of crap game. Scott Linebrink personally owes you a refund. Good article about The Safe we call home. It sounds dumb if you don’t live here, but the trainwhistle actually grows on you after a while. It’s like you hear that horn blow and everyone thinks, “Alright, here come the Mariners!” Of course the Mariners usually don’t come around and do much, and we even know this beforehand. I guess that’s the Seattle sense of irony and sports-related sarcasm at work. Joanna – To be honest, all that whistle made me think was that a freight train was going to come crashing through the perimeter of the ballpark. 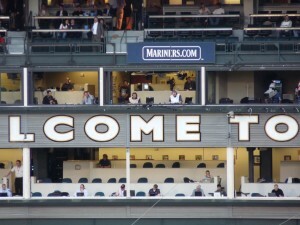 Maybe M’s fans’ acceptance of it is like how we Sox fans are used to the idiots banging on the buckets or the guys selling bootleg t-shirts and bottled tap water on the 35th Street bridge. Pac-10 – I agree wholeheartedly with your last sentence.